Warm water and a little sunlight create the perfect breeding ground for algae and bacteria to thrive — the last things you want growing in your swimming pool. Not to mention the stains and residue left from all the other chemicals and contaminants in your water. There’s got to be a way to keep the walls of your pool clean without dropping hundreds of dollars on potent shocks and treatments for your water, right? That’s where a good pool brush comes in. With a quick scrub, you can dislodge the buildup, getting it free in the water so your filter can drain it out. Read on to discover the best pool brushes for your particular pool, and what to look out for, before you buy. Why Do You Need a Pool Brush? 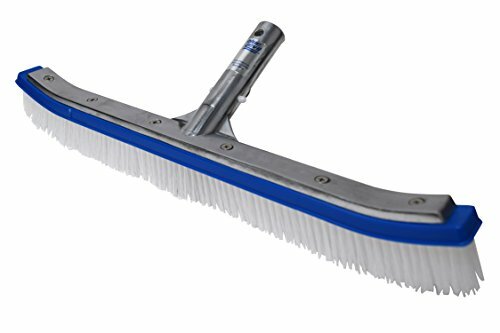 A pool brush is a rather simple tool that forms a highly useful step in your pool cleaning and maintenance routine. You use it to scrub the walls of your pool. This not only helps your pool to look clean and sparkle (by eliminating the bacteria and algae growing in the walls), it stops chemical damage to your pool walls. Calcium and other minerals in your water will collect on the walls to cause pitting and damage, shortening the life of your pool. While an automatic pool cleaner will help, you really need to give your pool a good brush once in a while to dislodge all of these build-ups. What Types of Pool Brushes Can You Buy? The head of your pool brush is what keeps all the bristles in place, and at the right angle so you can effectively scrub the different surfaces in your pool. You want to find a metal-reinforced head on your pool brush, as this will allow you to add more pressure than using a plastic head alone (that will most certainly break, especially after months of use in your pool). The best pool brushes are supported with aluminum reinforcement, to keep the head lightweight, yet strong enough for a good clean. I’d also consider the shape of the head, as you want a brush with a slight angle on the edges, to help you clean around contours, in corners, and under tight areas like the back of your ladder. As the part of the brush that actually scrubs your walls, you need to ensure the bristles are stiff enough to do a good job. Too soft, and the brush will not work. Too strong, and you risk damaging your walls, especially if you have a vinyl or fiberglass pool. Nylon and poly bristles are the softest, and won’t scratch or damage your liner. For a stronger clean, you can always opt for a brush with a combination of stainless-steel bristles and nylon, and some are even entirely wire, ideal if you’re wanting a good scrub on a concrete pool. Just be careful if you’ve been using a brush for a while, as the bristles will eventually start to fall off and collect in your pool, which can then clog up your filter. Once the shedding begins, it’s time to buy a new pool brush. What’s the Best Material Combination? The materials for your pool brush depends on the type of pool you have, as well as the level of clean you’re wanting to achieve. Generally, nylon bristles are recommended as the first step. You’ll get a decent clean without any concern you’ll damage your vinyl liner, fiberglass shell, or leave any scratches at all as you scrub the walls. It’s a good idea to start here if you’re not sure which is best. If you have a particularly tricky pool, with a pebbled, plaster or concrete base, you can try either a nylon and wire combination or complete wire pool brush to remove any stubborn build-up and stains. Let’s go over some of the main criteria you should apply to your decision making process when it comes to buying a swimming pool brush. Pay particular attention to the size of the pool brush you’re buying. Generally, 18-inch brushes recommended for most pools, as it helps ensure you’re doing an efficient job scrubbing the walls every week. A big brush makes your job that much easier. If you’ve got a larger pool, you may want to find a brush broader than 18-inches. 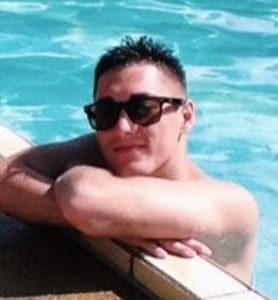 Smaller pools may allow you to get away with a smaller brush (you can get spot cleaning brushes down to about 5-inches), but it will get tiresome using a small brush to clean a large area. Is It Suitable for Your Pool Type? Of course, the last thing you want to do is damage your pool, so this becomes an essential consideration. You need the right brush for your particular pool. If you have a fiberglass or vinyl-lined swimming pool, the only type of brush that’s safe to use is one with poly or nylon bristles. Wire bristles will scratch the surfaces of your pool, potentially even creating tears in the vinyl. You don’t want this. Now, if you’ve got a concrete or plaster pool, a pure poly or nylon brush may not be strong enough to clean out all of the build-ups in the walls. This is where you’d opt for a combination wire and nylon, or a simple wire brush. The sturdier walls can stand up to a good scrubbing, without being damaged, and it may be necessary to scrub a little harder to get them clean. Is It Suitable for Your Pool Shape? The shape of your pool will also influence the brush you buy, as you want to ensure an even and thorough cleaning as you scrub. If you have a square or rectangular pool with sharp corners, you’ll probably find the more flat and rectangular brushes are best. If you have a round pool or one with lots of curves, it makes sense to buy a brush with a curved head, to help you clean it effectively. Does It Come With A Pole? The lack of a pole when buying a pool brush will often catch first-time buyers by surprise, but most of these products will not come with a pole. And for a good reason, the telescopic poles are large, which would bump up the shipping costs and they aren’t even the part that usually fails. It’s the bristles that go first. What you need to watch out for is how a particular brush attaches to the pole. It needs to be compatible, so it can just “click on” to the pole you have, (or are planning to buy). Most brushes will connect to a standard pool pole, but be sure to double-check before you buy. Considering the prices that most pool brushes are going for, it goes without saying that this isn’t a product that will last for years and years and years. Cheaper models will often give out after just a few months, while the more premium models may last a couple of seasons before they need to be replaced. You’ll know when it’s time, as the bristles will be falling off the head and into your pool. You can extend the life of your pool brush by rinsing it in fresh water after use, and storing it indoors and away from sunlight once you’ve finished cleaning. So far we’ve covered why you need a pool brush, the different variations you can find, and what features are important to focus on. 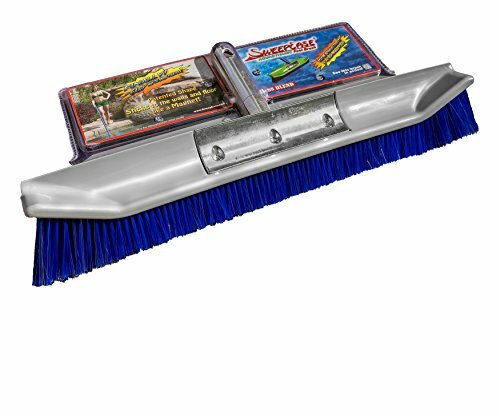 Designed by Blue Devil, this is a metal-reinforced wall brush for your pool, that uses soft poly bristles, so it’s perfect for above-ground vinyl pools. The curved head helps you to reach even tricky spots around the stairs and steps of your pool, cleaning out algae from the tightest corners. What I like best with this brush is the price, it’s an economical option if you’re merely looking for a cheap pool brush. The downside is the quality, some users found the bristles would fall after just a few months, and it is probably only going to last one season. Designed by Milliard, this is a metal-reinforced wall brush, that has been specially made to help owners of above-ground pools with vinyl liners clean the algae build up. 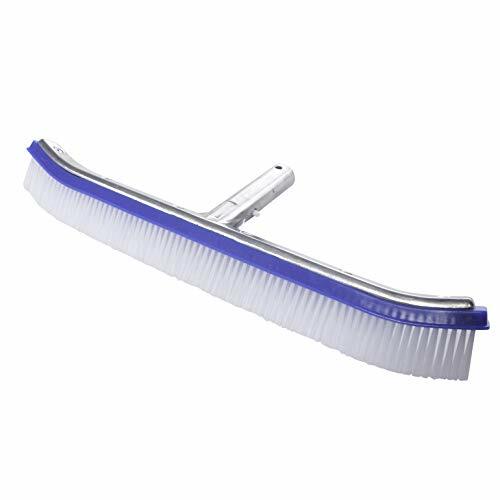 Featuring stiff poly bristles positioned at a 45-degree angle, this helps you to get an aggressive clean while still being gentle on vinyl and painted surfaces. What I like best is that the bristles won’t shed everywhere when you’re using it, though the ends could be more curved to help you navigate stairs and other tricky areas, while avoiding damage to your liner. Designed by Milliard, this is a heavy-duty pool brush, that incorporates nylon and wire bristles to clean even stubborn algae in your in-ground pool. Featuring curved edges to help you reach into the corners and under stairs, it’s got a strong aluminum backing and handle, so you’re not sacrificing weight for quality. What I like best is just how easy it is to remove the algae build-ups without destroying the painted floors and walls of your pool. The only downside is the durability, some users have found the nylon bristles start to wear and drop after just one season. Designed by Wall Whale this particular pool brush uses a patented “tail fin” to help you generate 10 times the force of other pool brushes, using only a single hand. 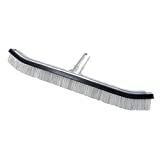 Kind of like how the spoiler on a sports car helps push the wheels to the ground, this brush operates on a similar principle. 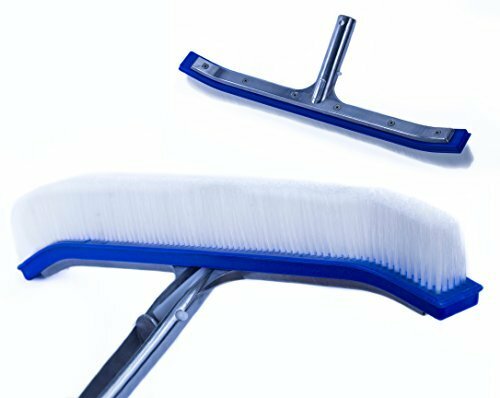 With each downward stroke, the fin helps keep the brush in place, giving you more leverage for a better clean. What I like best is how well this brush works on large wall surfaces, especially if you’ve got a severe algae problem in your pool. The only downside is the fin, it’s a little large, and it makes it difficult to use this brush on your stairs, steps or in the awkward areas of your pool. Designed by CJ Lifestyle, this is a lightweight pool brush, with nylon bristles perfect for cleaning your above-ground pool that won’t damage your liner. 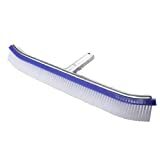 Featuring a curved plastic head supported by a metal handle, the company even offers a 100% lifetime guarantee on the brush. What I like best is how strong the brush head is, there is no bend as you use it ensuring you get a great scrub. The biggest downside is actually the ongoing customer service, a few people have had their warranties honored, many complain they can’t even get a reply. Designed by SweepEase, this is a stainless steel and poly bristle pool brush to help you eliminate algae, calcium, and sodium build ups on concrete, plaster, and tiled pools. 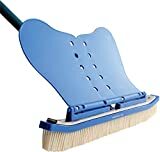 Featuring a spoiler like the Whale Classic, this is a highly durable pool brush that will stick to your walls as you clean, adding 5 to 10 pounds of extra cleaning pressure, before slicing back with minimal resistance. What I like best about this brush is there are no moving parts to wear out, though some people have experienced problems with the plastic clip that connects the brush head to the pole wearing out. 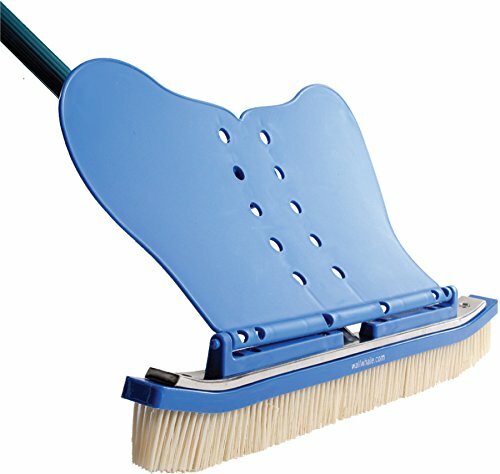 Overall, the best cleaner for your pool is the SweepEase Pool Brush. The added fin is sturdy and durable, giving you an additional 5 to 10 pounds of pressure on every downward scrub. This allows you to do a quick and effective clean, even down to the hard to reach places like the stairs or behind the steps. Just remember this brush isn’t suitable on vinyl or fiberglass pools (owing to the stainless steel bristles), for that you should look to their Poly Brush. Alternatively, the Milliard Nylon Pool Brush is also a great buy, one that’s been made explicitly for above-ground pool owners who want to take better care of their vinyl liners. The stiff bristles at a 45-degree angle allow for an aggressive clean, while still being gentle enough that it won’t damage your pool as you clean. Scrubbing the walls is an essential step in keeping your swimming pool clean and clear, and with the right pool brush, you’ll find this becomes a quick and easy job. So, you can get back to the things you enjoy, like actually taking a swim.